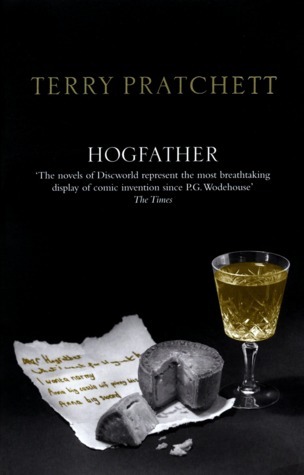 Cover of “Hogfather” by Terry Pratchett, one of my favorite books. The key passage of the novel occurs near the end, when Death explains why he took over as Hogfather to his granddaughter Susan (which is a long story in itself). Death’s dialogue is in small capitals, indicating he sounds like the lettering on a tombstone, or Alan Rickman with a chest cold. You think so? Then take the universe and grind it down to the finest powder and sieve it through the finest sieve and then show me one atom of justice, one molecule of mercy. And yet— Death waved a hand. And yet you act as if there is some ideal order in the world, as if there is some…some rightness in the universe by which it may be judged. The whole scene is worth reading, but of course you should read the book. Go do it now. I’ll wait. Death’s little speech is obviously not intended to be an earthshaking philosophical treatise. But he’s got it right. Justice, rightness, mercy, even value: those are things we assign to the world, not things that the world hands to us. The question is what kind of world we want to live in. And of course, that includes what we want from science, which is not a separate endeavor from the rest of human activity. If you hang out with scientists a lot, you’ll hear the argument that science is a meritocracy. People are successful, the argument says, because they’re good at science. If someone doesn’t succeed, it’s because they couldn’t hack it: they weren’t good enough. That the field is stacked with white men? That’s because either white men are better at science (if you want to be openly racist about it), or because it just happened that white men were the best candidates every time a department hired someone, every time a graduate school selected its new roster of students, every time people were promoted to higher ranks. Two justices on the Supreme Court in the United States even said words to this effect recently, but they are far from alone in thinking that sort of damaging nonsense. We can see the result of accepting the scientific culture as it is. What we have is a culture in which scientists see teaching and advising as onerous duties rather than a necessary part of making the field better. Ours is a world in which a huge number of science journal articles are forgettable results written up badly for the sake of keeping up publication numbers, where grant money is the most important thing a scientist can bring to a university, where a department with two white women is “diverse”. This supposedly reflects neutral values, ones based on performance and merit, rather than squishy unscientific ideas like diversity. But do these values reflect what we want science to be? And who gets to decide? Because that’s the real question. Social justice in science — as with social justice in general — isn’t something we can derive from deeper scientific principles. Conversely, there is nothing ingrained in science that says every department needs to be more than 80 percent white, so if the reward system we’ve constructed creates that, we have to ask why. It’s not like every white male scientist is the greatest researcher, so great that nobody else could do their job. We are the ones who decide what constitutes good science, and good scientists. If the system benefits a few Big Names who hog the grant money and squash ideas they don’t like, we shouldn’t pretend that’s the way things have to be. We shouldn’t pretend the research money and major publications brought by a serial sexual harasser outweigh the damage he did to the lives and careers of many women. We shouldn’t hide or wink at bad behavior because someone is Doing Good Science. We shouldn’t pretend the unbearable whiteness of science is inevitable rather than a historical happenstance, supported by cultural institutions founded on white supremacy and other questionable concepts. Instead, we should acknowledge the racism and sexism and other prejudices that have made the scientific community what it is today, and actively work on fixing them. A scientist who is a good teacher should be rewarded for teaching. Good mentors are worth a lot to those they help and inspire. Having teachers and mentors and researchers from a variety of backgrounds benefits a community also drawn from a variety of backgrounds, not just one homogeneous group. It’s past time we stopped defining a “good scientist” merely as someone who publishes a lot of papers, and include that stuff like mentoring, teaching, and — yes — working for social justice in science. If enough of us believe that and work for it, maybe we can make it true, or as close to truth as science can ever achieve. “You make us sound mad,” said Susan…. I’ll take every novel Pratchett wrote over any drivel from Ayn Rand, who did intend every speech to be momentous. I also think about a male physicist who is far better known than Geoff Marcy, whose bad behavior is an open secret in the community, but who is too famous and prominent to be brought down. So, he’s likely to keep doing it forever. Why not? Nobody’s stopping him. I love this, especially “the unbearable whiteness of science.” Thank you.